Welcome to my first Stacking the Shelves post. 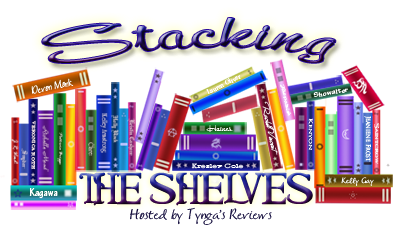 Stacking the Shelves is a feature hosted by Tynga at Tynga's Reviews. This is where I can post about the books and book swag I received this week. I will be posting my list on Sundays and will include anything I received Sunday through Saturday. To start with I’m sure my lists will be small and mostly freebies I found at Amazon. Over time I hope my lists will grow to include ARCs or other books given to me for review. I’ve recently gone on a book buying hiatus because I’ve discovered several books owned by family members that I’d like to read. So I’m trying not to buy many books and I think I’ve controlled myself well. *Please check prices before one-clicking* Book titles link to Amazon. Blast of the Dragon’s Fury: A Hilarious Dragon Epic Fantasy Books with Dragons (Andy Smithson 1) by L.R.W. Lee - I saw a tweet for the cover of the newest book in this series and liked it. So I had to check out the author and found I could get the first book free. I’ve never read anything involving dragons. So I’ve decided to give it a try. Elsker (Elsker Saga 1) by S.T. Bende - I’m not sure where I found this one. But the cover is beautiful! Bad Things (Trista & Danika Book 1) by R.K. Lilley - I found this one on Twitter. I had recently read a review of one of her other books and this one was touted as a favorite. So I couldn’t pass it up. Stupid Girl (Stupid in Love Book 1) by Cindy Miles - I believe this was one I had on my Amazon wishlist. I frequently check my wishlist for books that are now free and then one-click them. Lichgates by S.M. 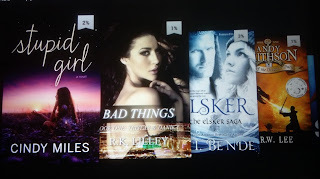 Boyce - I entered several of the Facebook Trick or Treat Giveaway Hop Stops and liked several authors in this process. When I took a break from entering, a sponsored post for this free e-book came up and contained a beautiful yet creepy picture. I had to click and sign up for the newsletter so that I could get this freebie. The cover won me over. A Summer Like No Other by Elodie Nowodazkij - I believe this was another Facebook sponsored post. I’d seen a cover picture Ms. Nowodazkij had posted several weeks ago of her bilingual novel (one page is English, next page is translated in German) and loved the idea. The book sounded good too. So when I saw I could get this for free I went for it. Watcher's Web by Patty Jansen - I don’t remember how I found Ms. Jansen’s signup page. It was probably through some other contest. Now that I list them all out, I realize that I picked up quite a few books this week. I’m looking forward to reading these and supporting them. By the way if any bloggers out there have suggestions on book cover images to use, please leave them in the comments. I only own these on my Kindle and therefore don't have the actual book to photograph the cover. Yay! My first comment! Thanks so much for checking out my list. Yes, several of the books drew me in just by the cover. Great list, I don't think I've ever read any of them yet. Happy reading! Thanks so much for checking out my list! I'll have to check out your blog.